Sailor Nail Art — Free Makeup Samples and Weekly Tips — from Makeup Chick! Ahoy! To get this cute sailor look on your nails with little anchors, you’ll need patience, but it will be worth it! My thirteen-year-old assistant did the manicure pictured here, all by herself. Start with a clear base coat, then paint your nails with a layer of white polish. Get some clear tape and touch the sticky side a couple of times with your fingers to remove some of the stickiness. This will help keep the tape from sticking too hard on your white polish and pulling it up. 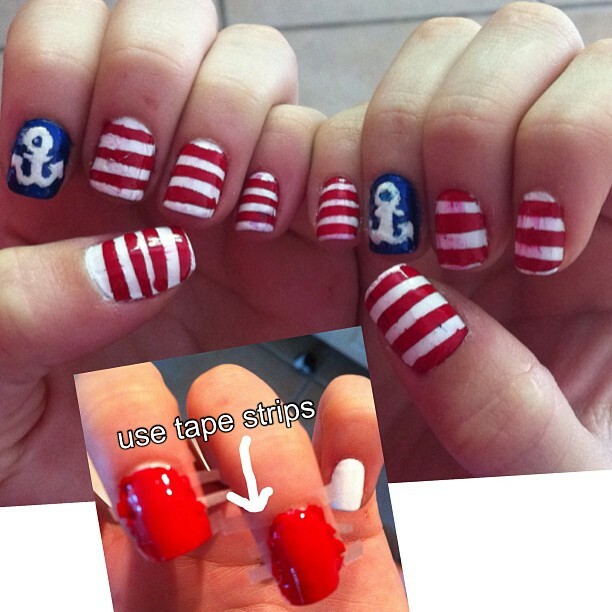 Cut the tape into very thin strips (see insert at the photo), and lay several of them on your nails. The stripes do not have to be completely parallel, but the closer you can get them to match, the better. Then paint over your nails with a thick layer bright red polish. When it has COMPLETELY dried, you can pull up the tape and you will have stripes! Make sure you wait long enough. For the anchor nail, you are going to have to get creative and use your artsy skills. Paint the nail Navy blue. When it is completely dry, draw a tiny anchor in white polish. You might find it helpful to use bits of tape to block off parts of it. Use a touch of blue in the center of the white at the top in order to draw the hole for the anchor rope.